Despite its name, the sweet potato is not related to Irish or white potato. Potatoes are members of the Solanaceae family whereas sweet potatoes belong to the morning-glory family (Convolvulaceae). Sweet potato is one of the most important food crops in the developing world, where over 90% of the production is found. North Carolina and Louisiana are leading producers of sweet potato in the US. 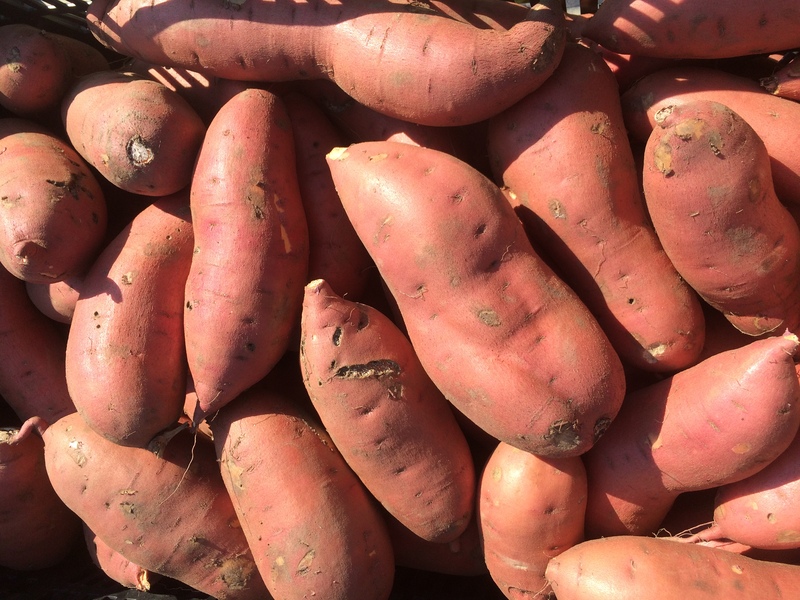 The skin of sweet potatoes can be yellow, orange, copper, red, or purple; the flesh can be white, yellow, dark orange, red, and purple. Copper-colored skin with moist orange-colored flesh are the most common types sold in New England; however, many ethnic populations prefer the starchier white-fleshed varieties. Sweet potato is a frost-sensitive crop that needs between 90 and 150 days of frost-free period to produce harvestable roots. Sweet potatoes are grown from slips of vine cuttings. Slips can be produced by placing sweet potato roots in warm (75-80F) moist sand or soilless media until sprouts are produced (about one month). Slips are then pulled from the bedded roots and planted. In southern areas of the US, larger growers produce their own slips. It is recommended for New England that slips be purchased from companies that provide certified disease-free slips. Sweet potatoes grow best in well-drained, loam soils which result in larger and well-shaped roots. Sweet potatoes grown in heavy clay soils, or in soils with high soil OM may produce rough, irregular roots. Field planting begins when all chance of frost has passed. Soil temperature in the production field should reach at least 65°F at a 4” depth for 4 consecutive days before transplanting. Research at UMass showed that yields were increased by using raised beds covered with black plastic mulch. In New England, it is difficult to obtain good yields on bare soil.